Wednesday was no average school day for young high school football players around the country. Wednesday was National Signing Day, where athletes must select which college they want to play football. 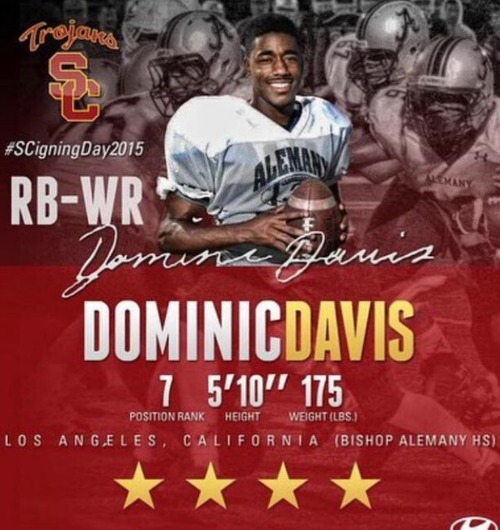 Alemany High School’s prize possession is Dominic Davis, University of Southern California commit. Davis has a rare athletic talent. He is a track star at Alemany and is considered one of the best running backs in California. Although Davis is listed at 5’10” and 175 pounds he certainly makes up for it with his blazing speed, running the 40 yard dash in 4.4 seconds, the 100 meter in 10.47 seconds, and measuring with a 39-inch vertical jump. This combination of speed and athleticism will help Davis fit in nicely with the Trojans new up tempo offense run by coach Steve Sarkisian. Davis said he joined USC because he felt totally comfortable with the program, understood their plans for him, and is very excited about the future. Davis was encouraged by the rebuilding program and elevating the Trojans to their former stature, following the lifting of the NCAA’s heavy sanctions. Davis is not sure which position he will play as a Trojan but hopes to be a receiver, or in his more natural position as a running back. Davis has mentioned he would like to be positioned similar to a Reggie Bush type of role where he could have the ability to catch passes out of the backfield. Davis had been invited to many USC football games. He experienced the atmosphere on the field and in the locker room. Davis said the players were extremely focused and ready to go out and give it their all. Davis made a critical decision during Alemany’s football season. He decided to de-commit from the Washington State Cougars and verbally pledge to play football for the USC Trojans. Davis said the reason why he flipped schools was mainly the lack of exposure that he would have gotten and the direction the program was headed. Davis also decided to switch schools as he knew that USC would offer a superior education in the event that a football career might not ultimately pan out. I asked Davis how the recruiting process went and asked what he most appreciated about Coach Sarkisian. He said Sarkisian “kept it real,” told him that USC was building something special and wanted Davis to be a part of it. Davis said he hopes fellow recruits John Houston, Rasheem Green, and Long Beach Poly High School standout Iman Marshall will decide to join him as Trojans. He believes his speed gives him an edge in the deep running back depth chart at USC. Davis ended by saying he expects the Trojans to win the PAC12 championship this season.